Most sreaming music supports both iOS and Android version. Users can download the corresponding version according to their mobile devices' system. 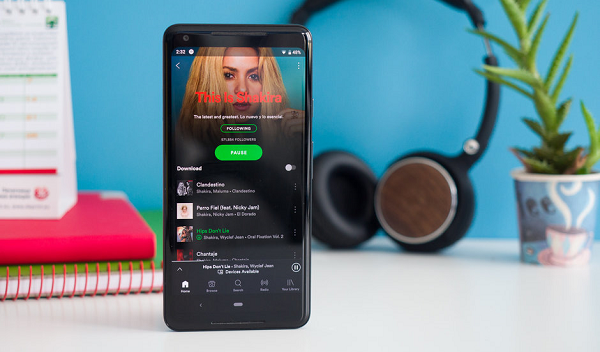 Without exception, Spotify also supports Android version, users can download Spotify Music - Android Apps on Google Play directly. If you have been Spotify Premium users, you can use Spotify to sync songs to your Android devices. Please make sure your Android devices have been installed Spotify App as well. Now login your Spotify for Android App, and connect the device with your computer via a USB cable or Wifi. Just in the Spotify desktop software, find the "Device" list, and choose your Android device which have connected to the computer. And then you can "Sync your device with Spotify". There are two options for users to choose, "Sync all music to this Android device" or "Manually choose playlists", choose one for you and then click for offline listening. All the syncing will be start automatically. Since you can sync your Spotify songs to Android devices via Spotify for Android, in other words, you have to plat these synced songs via Spotify for Android. If you want to use other music player for Android, sorry, you can't, because of the DRM of Spotify songs. Are there any ways to remove DRM from these songs and then convert them to MP3, AAC and so on, so that users can sync the converted MP3, AAC files to the Android devices, and play them on whatever audio player App as you like. MP3, AAC can be supported by almost all audio players. Follow the next guide, you can easily free your Spotify songs from DRM. And this is very simple. What you need is downloading the Spotify Audio Converter Platinum for Mac at first. Step 1. go to download and install Spotify Audio Converter Platinum for Mac and run it. If you are a Windows user, please download the Spotify Converter for Win version. Step 2. From Spotify to drag Songs or playlist to Spotify Audio Converter. Click "+" icon or click center of Spotify Audio Converter Platinum, then you will see a pop-up window which indicates you to drag and drop the songs or playlist here. When the above steps are finished, just click "Convert" button to start conversion.